A very rare palm known only from G Gaharu on the border with Kalimantan in the 1st Division; endemic. Solitary, low, short-stemmed erect rattan, not exceeding 2 m tall. Stem without sheaths c. 10 mm diam., with sheaths c. 18 mm diam., internodes c. 5 cm long. Sheaths armed with abundant, close, oblique and horizontal combs of black or straw-coloured spines, 1-22 mm long and abundant pale brown tomentum; ear-like processes c. 8.5 x 1.5 cm, gradually tapering, convex, armed as the sheath on the outer surface, the inner surface unarmed. 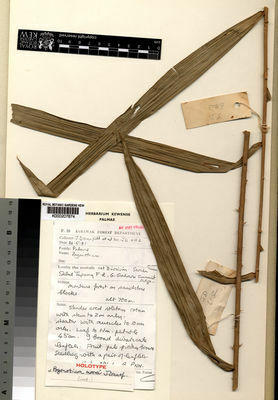 Leaf to 1.1 m, ecirrate or with a minute vestige of a cirrus; petiole to 50 cm, scabrid, armed with scattered reflexed spines; leaflets few, distant, regularly arranged, c. 9 on each side of the rachis, ± divaricate, the longest c. 32 x 2.5 cm, the apical pair much smaller, the margins sparsely bristly, otherwise bristles lacking; young leaves tinged pink. Inflorescence, only female known, very small and inconspicuous, held erect between the auricles; peduncle very short or absent, the prophyll c. 12 cm long, split opposite the leaf sheath (?always), hairy and bearing abundant spines and spicules as the sheath; other bracts small. Flowers small, glabrous. Mature fruit obpyriform, c. 13 x 9 mm, tipped with a short beak and covered in 15 - 16 vertical rows of pinkish-brown, scarcely channelled scales. Seed ellipsoid, c. 11 x 7 mm, the sarcotesta thin. Seedling leaf with 2 very small widely diverging leaflets tipped with bristles (Fig. 98).